I'm gluten intolerant (I always rush to point out I got diagnosed at the hospital via a skin prick test, I'm not just being trendy) so I try to substitute wheat products where I can. The cheapest way of doing this is to make our own. I have given up making completely gluten free bread and cakes after many years of trying and producing some really unsuccessful baking. The alternative I have found that works best to produce really delicious, well risen, light cakes, breads and biscuits is to simply substitute all or some of the wheat flour for spelt flour. This would not be suitable for anyone who has an allergy to gluten, since spelt does contain gluten, so please don't use spelt to make treats for coeliac friends and family - you will make them very ill. However, for my own purposes I find I have reduced symptoms with spelt's lower gluten content. It is also supposedly superior to wheat nutritionally, apparently only being overtaken in popularity by wheat because wheat is easier to thresh (it's tougher convincing spelt to part with it's husk). Mix it all together, then spoon into paper cases in a cupcake tray. It doesn't look like enough mix, but you can see from the picture how much they rise up. Put them into a hot oven - about 200 Degrees Celsius. I don't know how long they took as I cook by smell and don't tend to look at the clock - when they smell good, poke a fork in - if it comes out clean they're done, if there's mix stuck to it pop them back in for a few minutes. Probably about 10 minutes in total. When cool, ice or add cupcake frosting. We make icing by stirring a few teaspoons of strongly brewed berry tea into icing sugar powder. It makes pink, strawberry flavoured icing without the worry of kids reacting to synthetic dyes or flavours. You can get more technical with separating eggs, beating them, folding them into butter and sugar that has been beaten until fluffy and so on but for cooking with kids I find this recipe pretty foolproof as it just involves chucking everything into a bowl and extracting any stray bits of eggshell. 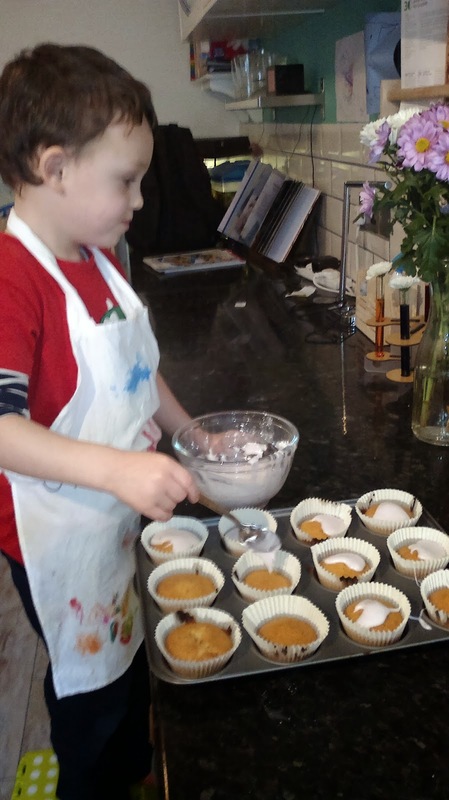 Ollie likes to help measure out using the scales, but for smaller or less patient children you can measure out in advance into small plastic bowls and let them tip them into your mixing bowl. We used mixed wheat flour and spelt because I had some self raising to use up, but all wheat or all spelt also work fine. You can buy wholemeal spelt flour, but I find this produces a really dense 'healthy tasting' cake or bread and is best lightened by mixing with white flour of some kind.